Foot problems can be a nightmare for anyone who exercises upright. The fact that the foot must interface with the ground consistently can jeopardize your workouts (and therefore your health) when there is a problem there. Plantar fasciitis is a common foot problem that effects people that engage in all kinds of activates; from recreational walking to higher impact versions of exercise. Plantar fasciitis is an inflammation of the plantar fascia-the thick webbing of fascia at the bottom of the foot. The symptoms are most commonly felt at the heel where the plantar fascia and the Achilles tendon mesh with one another. The pain is usually sharp and progressively gets worse over days or weeks. Plantar fasciitis does not occur overnight. The symptoms are usually the worst when the foot first hits the floor in the morning. But symptoms may also be triggered after standing following long periods of sitting. In both instances there is a “pulling” at the attachment on the heel. Very often the symptoms lessen after the foot and body have been warmed up. This is because the fascia must lengthen when the foot is flat on the floor and tighten as we push off. “Warmer” tissue will be more compliant to lengthening and therefor create less pulling at the heel attachment. Traditional exercise interventions for helping treat or prevent plantar fasciitis involve stretching the calf. This is because both calf muscles (gastrocnemius and soleus) attach to the bottom of the foot and plantar fascia via the Achilles tendon. Flexibility in the calf transfers to improved flexibility in the plantar fascia. But the only way to effectively stretch both calf muscles is to stretch with the knee straight and bent. Bending the knee releases the gastrocnemius and allows better application to the small, deeper soleus. If we take an integrated look at the body as we do at Function First, we can see that the tightness in the plantar fascia can be connected not to just the calf, but to the hamstrings and all the way up the lower back. And we must also realize that the calf muscles don’t only get tight in a front to back motion. They also can be tight side to side when the foot pronates or supinates. 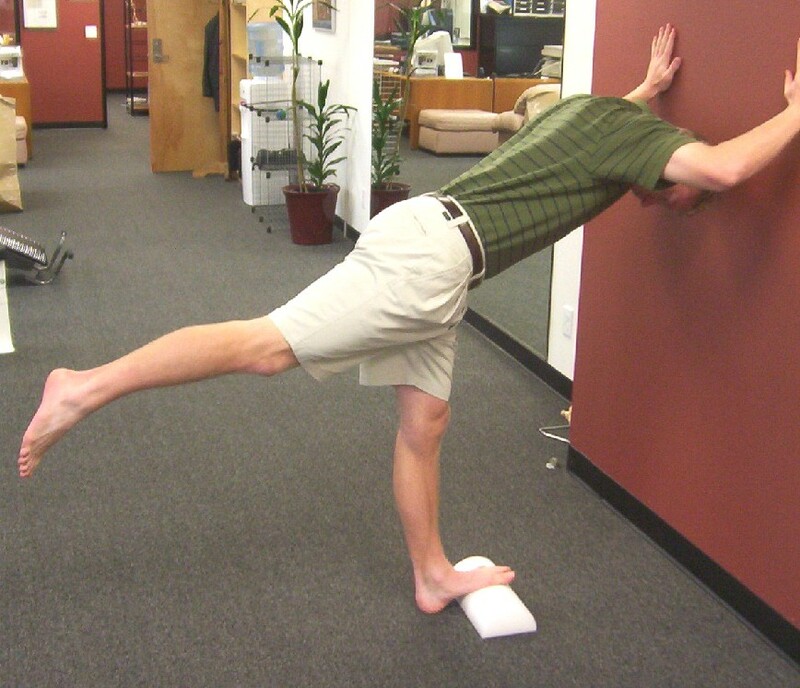 Therefore, for many people the calf stretching exercises they do provide limited or temporary help. Muscles should never be stretched cold. And if you are experiencing plantar fasciitis symptoms this is even more critical because as you attempt to stretch the cold muscle you can actually do more damage. With plantar fasciitis you must also be very careful not to stretch to the point of pain. It should be a gentle, comfortable pull. If you do not have plantar fasciitis it is OK to stretch to the point of mild discomfort. Stand facing a wall with the toes of one foot elevated 3-4” off of the floor using a book or the like. Make sure the foot is pointing straight ahead. Place your hands on the wall for balance. Lift the knee of the other leg straight up toward your chest. From here, bring the leg straight back behind you. As the leg is moving behind you the torso should lean forward toward the wall. This should cause the knee to straighten more on the leg that you are stretching. As the knee straightens more the stretch should become more noticeable up the back of the entire leg. Immediately bring the knee back up toward the chest and repeat. This is a dynamic but controlled stretch so there is no hold. Do this for about 10 repetitions. Next, lift the knee again and hold the leg up so that the thigh is parallel to the floor. From here, move the knee across your stance leg and then all the way to the other side like a gate that is opening and closing. Your hips/pelvis should turn as you do this. Repeat this movement dynamically 10 repetitions to each side. The final motion is bend the knee of the support leg about 15 degrees. The stretch should be felt lower and deeper on the calf now. From here repeat the side to side motion 10 more times to each side.